Beyond the Drama, Her Heart Was Real. From the moment her marriage to prince Ahab thrusts her into the intrigues of palace life, Jezebel’s exotic beauty opens doors and her will breaks down walls. 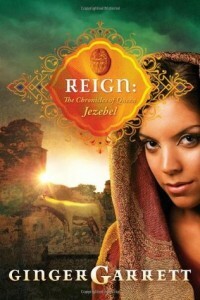 Torn from her homeland and wed to power in a strange country, Jezebel vows to create a legacy and power all her own. Some might call her a manipulative schemer, bent on having her way. But they don’t know the whole story, and she was much, much worse. As she moves through the halls of power, her heart struggles between devotion to the gods she worships, the prince who loves her, and her thirst for revenge. She sparks a battle between her strangely powerless gods and the God of palace administrator Obadiah—a God who confronts her with surprising might. She will fight, though victory may cost her everything. This was an ARC sent to me by NetGalley a long time ago and due to unforeseen circumstances, it was one of the novels relegated to a forgotten status when I had to limit the amount of books I read a year. Yet, whenever I found a chance I would read for ten minutes, sometimes thirty, because the premise intrigued me. You see, as someone who is learning about the bible and various characters, the idea of Jezebel intrigued me. Was she a folk hero? A feminist? Simply misunderstood? I think because my knowledge of Jezebel was limited I was able to appreciate the literary aspects of this novel. If I grew up knowing Jezebel was a vile woman who would meet a disastrous fate, I perhaps would be a bit concerned, but to me this seemed to be a novel of literary standards, where you know Jezebel is defiant, silly, and most of all selfish. She is cunning, vindictive, but all for her desire to rule Israel. It must have been confusing to her, to learn of God, when she had such a pathetic husband in Ahab. If perhaps he had been stronger or someone around her taught her about Him, the biblical story would have ended differently- or perhaps she was predestined to this fate, without any choice in the matter. Her actions are never sugar coated and she is the woman of legend, but for me what was frustrating was how Ahab or someone of influence, be it male or female, did nothing to try to reach to her. Ahab found God, but he didn’t use that knowledge to his full advantage, causing Jezebel to mock God. She is as much at fault as those whole coddled her and simply allowed her to carry on. I think the greatest critique would be the ending as it gives the impression that Jezebel will be victorious. As you can imagine, after reading the novel I went straight to Wikipedia to find out what happened to her. There was an author’s note, but it doesn’t seem to match up with biblical interpretation. While some may question whether Jezebel is humanized too much, making her sympathetic, I wonder what that ending was all about. It gave the illusion Jezebel finally won, which well, isn’t true. Believing the bible isn’t necessary to enjoy this novel, but it will cause confusion with those unfamiliar with biblical narratives and those more well versed in bible lore. If you can put aside a few of the details and inconsistencies, you can appreciate the novel for what it is. If not, then I recommend you stay away, as you’ll be disappointed.